The Sci-Fi Chronicles expedition into the world created by Suzanne Collins with her bestselling Hunger Games trilogy, continue with the first part of the last book, divided into two films, with the second one forthcoming this holiday season. But knowing that it’s only the first part of a two-part story, I knew, going in, that I wouldn’t be completely satisfied with this film. Francis Lawrence who directed Catching Fire, directs this, and the last part of the series, that sees Jennifer Lawrence returning as Katniss Everdeen. 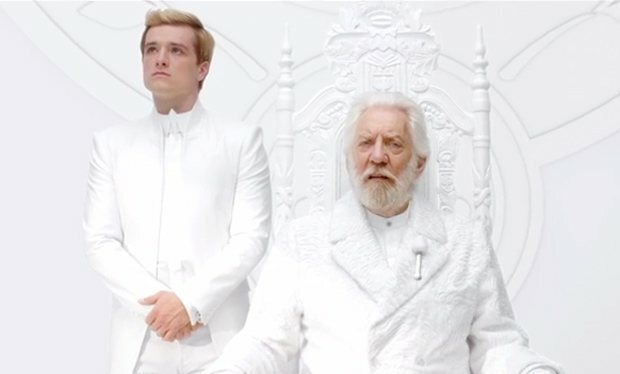 Having been rescued from the arena of the 75th Hunger Games, while Peeta (Josh Hutcherson) remains in the clutches of the Capitol, Katniss is having a tough time, dealing with her PTSD, as well as the ongoing lobbying by the rebellion’s own president, Alma Coin (Julianne Moore) and Plutarch Heavensbee (Philip Seymour Hoffman) for her to become the image of the resistance, the Mockingjay. This one runs almost a half an hour shorter than the previous films, clocking in at a bare two hours, though it does continue to expand the world previously introduced. And it shows the true face of war, and the propaganda that can often surround it. The rebellion is housed in the blasted out remains of District 13, where she is reunited with her mother, (Paula Malcomson), sister Prim (Willow Shields), Gale (Laim Hemsworth), Effie (Elizabeth Banks), Finnick (Sam Claflin), Beetee (Jeffrey Wright) and even Haymitch (Woody Harrelson). 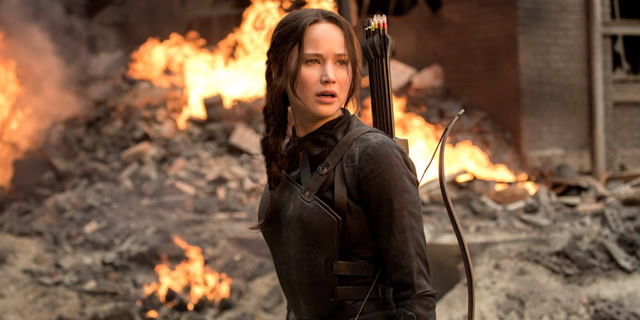 When Katniss sees the devastation that has been wreaked upon her home of District 12, heartbreakingly realized, she decides to take on the role the rallying point that the resistance so clearly needs. So begins a duel of propaganda, as Katniss with her new team, including Gale and Cressida (Natalie Dormer) put together promo films. Not to be outdone, President Snow (Donald Sutherland) strikes back not only at the people of the Districts, with threats and executions, but also at Katniss, herself, by using Caesar’s (Stanley Tucci) controlled interviews of Peeta to hurt her, mentally and emotionally. Through move and counter-move, the concepts of image and manipulation are played out against the backdrop, and within the context of war. Things seem to verge on disaster for the rebellion until an attack on a hospital pushes Katniss far enough to truly speak out, and rally the people, gearing them for war. But her own fears and worries over what may be going on with Peeta, keeps her troubled. But the forces with the rebellion are hard at work at amending that, as they rescue Peeta, only to find out that he may now be Snow’s most dangerous weapon. One that may break Katniss once and for all. Watching all three films consecutively, instead of years apart, gives them more of a complete feeling, and I’ll be interested to see how they wrap the film versions up.